Draw attention to your business and promotions with eye-catching Tail Feather Flags! Tail Feather Flag kit includes an 11 ft. heavy duty fiberglass pole, stainless steel rotating ground stake and carrying case. 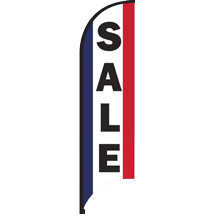 Simply install the Tail Feather Flag in the ground for quick and easy advertising. The Flag rotates in the wind so your message will always be visible. Steel Crossbar Stand, item 92010 and Waterbag Weight, item 92011 also available.